Dimensions: 225 330 250 mm. Baking tray size: 200 mm. Electric egg Aberdeen machine using the overall quality of stainless steel, beautiful, easy to clean. Made of stainless steel, the panel is smooth and not rough, durable, not easily deformed. To rotate the way to adjust the temperature, effective precision temperature control, the left with a timer knob. Made of solid wood handle, strong heat, has a good anti-scalding effect, practical not perishable. Machine should be placed in dry, clean, ventilated position, the operation of the machine placed in a horizontal position and smooth. Indoor environment relative temperature should not be too high, otherwise it will reduce the electrical insulation properties, if necessary, install exhaust ventilation settings. For safety reasons, be sure to install the automatic modulation switch requirements 5-10A, must be connected to a reliable safety grounding device must have three feet with ground connection, the standard 5-10A cable socket. Handle the handle to be careful when installing the direction of the hose, do not bend too much, to avoid damage to the hose, the handle is installed, the direction of the hose along the hose on the machine rack. After connecting the power, turn on the switch, then the power indicator light, you can proceed to the next step of normal use, is the automatic temperature control. Single hose is the top cover, double hose can not be opened for the bottom cover, according to the direction of the arrow on the stainless steel plate rotation, otherwise it will damage the hose. General egg Aberdeen 3 minutes can be grilled, such as paste the pot in the pot brush a little oil can be. Every day after the normal work of the machine, clean the shell, not rinse with water, wipe with a dry cloth or shovel shovel, clean off the power to avoid leakage. 4 machine is too long, the machine aging failure, can not be used. If the machine fails, you must have a professional electrical maintenance certificate to repair the master before use. Turn the unit on and adjust the temperature to 200 ° C (the temperature at which the baked egg is heated, which may take a few minutes to warm up). Open the eggplant machine above a template, respectively, in the two templates on the brush on the amount of edible oil. Tilt the bottom of the template 45 °. Pour batter evenly from above. Until the whole piece of uniform even cover the batter so far, close the top of a template. Turn the two co-rotating plates 180 ° (role: the batter evenly coated die hole, the role of crisp outside the brittle). Open the above template and remove the egg with the food clip. 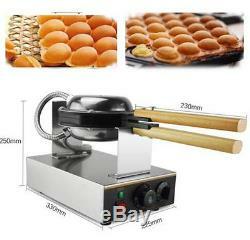 1 x Egg Cake Machine. Please feel free to contact me. The item "110V Electric Egg Cake Oven Stainless Steel Puff Bread Maker Waffle Bake Machine" is in sale since Tuesday, January 10, 2017. This item is in the category "Home & Garden\Kitchen, Dining & Bar\Small Kitchen Appliances\Waffle Makers". The seller is "goodstarshop" and is located in HK. This item can be shipped worldwide.